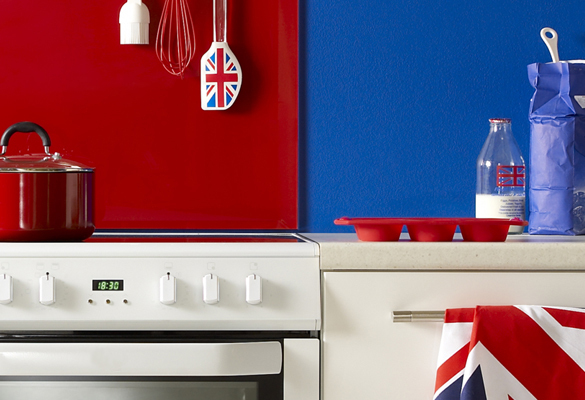 Is Your Kitchen a Typical British Kitchen? Ah, the kitchen – it’s a room to behold and cherish, isn’t it? When you consider just how much time we all spend in our kitchens, you start to realise just how important the room is to your everyday life. I mean let’s face it, it’s perhaps the one room we’d least like to give up if we had to lose a room in our house. You can sleep in the kitchen but you sure will find it difficult cooking in the bedroom! Kitchen designs change as you travel the world; a kitchen in Tokyo is going to be a lot different from a fitted kitchen in Manchester. That much is a given! So what makes a kitchen a typically British kitchen? What is it about our sculleries that portray us as being so stereotypically British? Read on and see if any of these apply to your house too! Okay we might as well get this one out of the way first. Yes it’s a stereotype, but yes it’s also 110% true for all of us. If you don’t have teabags, you’re not British; it’s as simple as that. Our kitchens may run low on some things from time to time, like bread or milk. But we never, dare ever, let our standards slip that low that we cannot offer thy fellow neighbour a hot cup of char! It simply wouldn’t be British! No British kitchen is complete without a copy of the local and/or national newspaper sat atop the kitchen table. Lay ready for the father of the house to flick through with his coffee; or for your mother to hit him around the head with for swearing at the telly. As a nation we love to have a good moan and there’s no greater fodder for it than the local newspaper. Unless you just love the gossip columns! For some reason, millions of us find the need to hang some sort of sign in our kitchens. Something along the lines of ‘Home Sweet Home’ or ‘Bless This Mess’ or ‘Nana’s Kitchen.’ The first two are cute; the last one is usually put up so that poor Nan remembers where she is. Now it’s become almost like a competition – who can have the quirkiest, cleverest kitchen sign!? We all love a good house party and the kitchen is usually the place to be at these occasions. Who knows why? There must be a science behind it. Most probably because it’s close to the booze and usually nearby the backdoor; so you don’t have far to run to throw up. C’mon, you’ve seen the Ikea advert – you’ll always find us in the kitchen at parties! In reference to the above, this makes perfect sense. Every kitchen has an alcohol stash, either secretly tucked away from thirsty lips or proudly placed on display inside a glass cabinet. There are of course countless options of how to store your alcohol, but the general rule of thumb is that you will find the sauce in the kitchen! This might not be just a British thing, but it is something the vast majority of us Brits have in our kitchens. For some reason, maybe through adoration, we give bread the special treatment when compared to our other groceries. I mean, the celery doesn’t get its own private room, does it? It’s like the bread bin is the penthouse suite and only the bread gets so occupy it – with the occasional crisp packet if it’s lucky! We all store our bins in different places. Some of us just place it on the floor, next to the back door or underneath our units. Many of us place our bins inside our cupboards whilst many others actually have their bins attached to their cupboards. Wherever you store your bin, if you’re British one thing is for sure – it has a flip-top lid. If it doesn’t, then it used to, and you broke it. Are we right? No British kitchen is complete without the occasional curtain twitch. Yes that’s right! We’re a nation of nosey neighbours and we know it! Especially if your kitchen faces out front onto your street! When you’re washing your dishes staring out onto the road, your neighbourhood suddenly becomes a soap opera and you can’t help but have a little peak at what’s going on. Go on you filthy curtain flicker! Fill your boots, everyone does it! This doesn’t apply to everyone but it may ring true with a vast number of families up and down the UK. Have you ever noticed food going missing from your fridge? Does it usually happen overnight, or when you’re not around? Have you, on the rare occasion, caught a mysterious teenage looking figure rummaging through your fridge without as much as a grunt in your direction? It won’t surprise you to know that the mysterious figure is probably your son or daughter – don’t expect a conversation just know that they’re fine! Mm chips! What’s not to love about chips? They are simply glorious and since the invention of the personal chip fryer, us Brits no longer have to rely on our local chippy! Okay, so they’re not the healthiest of cooking methods, but they make for a great treat every now and then. This may be near the bottom of the list, but a family feud is just as customary in a British kitchen as our beloved tea bags. Maybe it’s the sound acoustics that make it a great fighting room, or the fact that you’re near sharp objects. Who knows? What we do know is that the kitchen makes for a great battle ground with your loved ones! Whether you’re rowing with your mother or bickering with your sibling, one of you is likely to end up slamming the kitchen door! The contents of our fruit bowl usually outlive and survive all other bowls in the house – because we generally eat all the rubbish first! It’s a bad habit, but most of us Brits love a stocked up fruit bowl and enjoy emptying our biscuit barrels! If you do eat fruit regularly then this can become a pain – because you can’t have an empty fruit bowl! That wouldn’t be British! Many pet owners across the world keep their pet food bowls outside, or in the porch where their pets roam free. Not us. Here in the UK, we like to let our pets eat where we eat – and usually what we eat too! We love our pets so much in the UK that we usually place their food bowls in the kitchen next to the back door – so they don’t have to freeze outside!